west, and features spectacular views of the Main Range from both the east (Thredbo valley) and west (Geehi and Murray valleys). Distances are measured from the Snowy Region visitor centre on the Kosciuszko Road in Jindabyne, unless otherwise indicated. Driving conditions: Good access for two-wheel drive vehicles, as the whole Alpine Way is sealed except for a few very short sections. During winter all vehicles are required to carry chains, and fit them when required, due to possible snow/ice conditions. The road between Thredbo and Tom Groggin is not recommended for vehicles towing large caravans. Season: Year-round. Snow chains can be hired at Jindabyne or Thredbo and left at Khancoban (and vice versa). Accommodation: Jindabyne, Thredbo, Khancoban. Contact visitor centres for more information. Drive westward out of Jindabyne on Kosciuszko Road beside Lake Jindabyne, and after around 3km take the Alpine Way turnoff to the left, to Thredbo (34.5km) and Khancoban (113km). At Penderlea (around 8km from Jindabyne) you will see old stone buildings which are reminders of the pioneering efforts of the early families of the southern Monaro. The Alpine Way drops over a saddle before Bullocks Flat (around 20km), at which you will find an information shelter, and then continues up the scenic Thredbo River valley towards Kosciuszko National Park. The rocky outcrops of the Crackenback Range tower above the Bullocks Flat ski tube terminal. The ski tube operates throughout most of the year, taking skiers, sightseers and bushwalkers by train via tunnels through to two stops in the Perisher Blue Resort. The Bullocks Flat Skitube only operates for skiers and snow enthusiasts in winter. Kosciuszko National Park entrance, around 21 km from Jindabyne, and just after Bullocks Flat, is your opportunity to contribute to the development and maintenance of visitor facilities, including the road network, by paying the vehicle entrance fee! Thank you. At Thredbo diggings (22km), a picnic and camping area lies on the banks of the Thredbo River to your immediate right, among beautiful Black sallees. Facilities include camp sites, barbecues, picnic tables and toilets. A walking track along the Thredbo River will take you via Bullocks Flat (4km return), or via Muzzlewood Flat (3km return), to the ski tube, and a short detour leads to Bullocks hut, built as a holiday cottage for Dr H Bullock in 1934. ‘Muzzlewood’ was the term used by stockworkers for the wood of Black sallee trees, from which they carved the muzzles that they used to wean calves from cows. Further southwest along the Alpine Way another delightful relaxation spot awaits you, at the Ngarigo camping and picnic area (26.5km), named after a local Aboriginal people. thought that some people may have stayed in parts of the subalpine areas of this region all year round, ascending to the alpine areas in summer. Because of their knowledge of the geography of the area, Aboriginal people played an important role in showing new settlers the best routes through the mountains. The consequent loss of their land, the economic and spiritual foundation of their lives, meant that they could no longer survive as they had once done, and many came to rely on rations and blanket issues. Aboriginal people were eventually forced onto reserves established around the region, thus often losing important social connections, as well as their land. Despite the depradations of disease, displacement, assimilation and the removal of generations of children, a significant Aboriginal population still maintains its strong connections with this area today. Thredbo village (34.5km) is a European-style ski resort, with accommodation, restaurants and shops. Picnic sites with gas barbecues, tables and toilets can be found here. 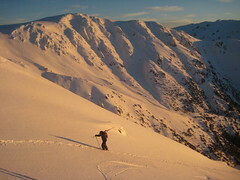 The resort has many ski lifts suited to both beginners and advanced skiers, and access to many long and sometimes steep ski runs, some among the highest in Australia. Thredbo is also open all year round for holiday-makers. trapped in this area during unexpected snowfalls, and died. wattlebirds and Silvereyes. Insects, including wasps, flies and moths, migrate south through the pass in spring. Spend some time here to read the information board or to walk one or more of the tracks. From Dead Horse Gap, the Thredbo River track follows the Thredbo, or Crackenback River, back to Thredbo (8km return). On the opposite side of the road the Cascades trail leads generally south to Bobs Ridge (10km return), from the road which walkers can enjoy extensive views of the Murray valley into Victoria to the southwest and the Pilot Wilderness area to the south. The trail continues into the Cascades past sheltered Cascades hut, built of timber slabs by stockworkers in 1935, and on south. VVatch for piles of horse dung left by the brumbies along the snowgrassed sides Thredbo River, which the trail follows initially. If you’re quiet, you may also see brumbies in this area. is a great place to see and hear Olive whistlers, shy olive-backed birds with of delightfully liquid ringing calls. If you’re any good at whistling, try imitating the calls and watch to see if the bird’s curiosity draws it towards you. The Australian Alps Walking Track follows the Cascades trail from the south and then at Dead Horse Gap it joins another track that leads from Dead Horse Gap to Mt Kosciuszko to the north. This track leaves from the right or northern side of the road, and travels up Bogong Creek to the Crackenback chairlift above Thredbo (5km one way). From Dead Horse Gap the Alpine Way continues on to Pilot lookout (45.5km) where visitors can gaze across the Pilot Wilderness (in New South Wales to the south) and the Cobberas Wilderness (in Victoria and further south). Nestled deep in the valley between the double peak of the Pilot (1831 m) and the jagged peaks of the Cobberas (1834m at their highest) lie the Murray River headwaters at Cowombat Flat. In this area the river is often called the ‘Indi’, believed to be an word meaning water plant. Approximately 6km further down the Alpine Way lies the Leather Barrel Creek camping and picnic area (51.5km), in a pleasant setting in tall eucalypt forest. Facilities include camp sites, barbecues, picnic tables and toilets. More rest area facilities, including tables, barbecues and toilets, and camp sites, are available another 8km down the Alpine Way at the Tom Groggin ‘Water Spider’ camping and picnic area (59.5km). Dispersed camping is permitted along the river as well. This was once a cattle-grazing district and part of Tom Groggin station. Nowadays you will find that kangaroos graze these grassy flats beside the Murray River, rather than cattle. Through the tall foothill forests of Manna gums and Candlebarks, you may catch distant views up to the south end of the Main Range (Rams Head and Kosciuszko). At this point the road comes close to the border between New South Wales and Victoria, which follows the Murray River. For a short while the Alpine Way also follows the Murray and the border north, past Tom Groggin homestead, on the Victorian side of the river about 3km north of the picnic area. Geehi (Swampy Plain River) camping and picnic area (about 81.5km), approximately 22km north of Tom Groggin on the Alpine Way, is a large, landscaped area on the Geehi Flats beside the Swampy Plain River. At this well-equipped site you will find camp sites, barbecues, picnic tables and shelters, toilets (with wheelchair access), information displays, and a paved walkway (accessible to wheelchairs and strollers) along the river. The stone Geehi hut was built to accommodate those who came to the mountains to fish. 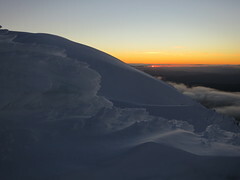 An unmarked walking route to Mt Kosciuszko follows Hannels Spur, nearly opposite the flats. This is a very long, steep and difficult walk that should only be undertaken by very experienced walkers who know the area and its hazards. The track was first cleared in 1928 for two stockmen, Alf Hannel and Kerry Pierce, to take cattle up to the summer pastures. However, it seems that the track wasn’t used very much as the cattle didn’t like the steep grades! Shortly the Alpine Way reaches the turnoff to Geehi Reservoir and Olsens lookout (about 84.5km), which will be on your right. It is a scenic gravel road which winds through moist fern gullies and tall wet forests to Olsens lookout (9km from the turnoff), where views of the rugged western face of the Main Range can be appreciated. Facilities includes toilets and picnic tables. Past the lookout, the road is open in the summer months as far as Geehi Dam (15km further north) on the reservoir. On the Alpine Way, another picnic spot can be found on the right beside the moist ferny gully of Bogong Creek (just over 86km). In spring, look for the bluish-mauve haze of the strongly scented Round-leaf mint bush in flower. Another lovely plant you may see here is Blanket bush – look for a small to medium sized tree with a spreading, rounded crown and low branches, with clusters of long dark leaves (not unlike rhododendron leaves). Feel the leaves and you will understand why it was so named. Canyon, Watsons Crags and Townsend Spur. The Murray 1 Information Centre (around 104km), a further 11 km north of Scammels Spur on the Alpine Way, is open every day except Christmas day. 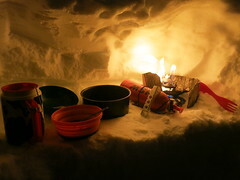 The centre features a wide variety of interactive displays and exhibits that enable visitors to see, hear and feel their way around the Snowy Scheme. Developed in 1997, the centre is designed around the single theme of ‘Water and the Environment’. With videos, lights, computers and photographs, there is something for everyone from eight to 80. The large white pipes of the station carry water originating from the headwaters of the Snowy River on the eastern side of the mountain range. Below the power station is Murray 2 Pondage, which provides water for Murray 2 power station, in the valley to the west, above Khancoban Pondage. 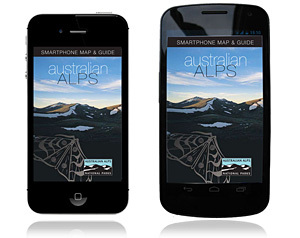 and for visitors to Kosciuszko National Park. While in Khancoban, don’t miss the Kosciuszko National Park visitor centre (turn to the right just after the pub), which presents visual and audio displays on cultural and natural heritage.